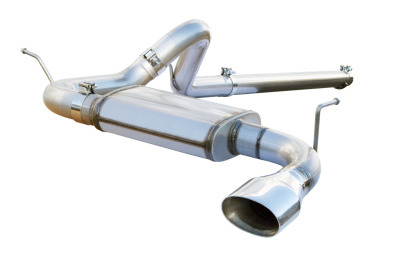 Give yourJeep more HP, MPG and a new aggressive tone with aFe's MachForce XP Jeep catback exhaust!!! AFE started out as a small business selling quality products such as intakes and filters. Over the years they have become one of the largest and most well known automotive intake companies around, this is because of their low prices and outstanding line of products. 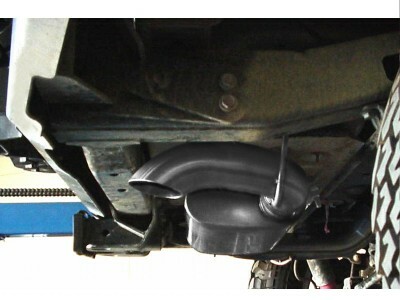 AFE has brought over this same technique of quality products to a whole new line of exhaust systems. They have spend years engineering and designing every exhaust system to personally match every single car or Jeep's application to make sure it sounds meaner and performs to it maximum capability. AFE has developed the aFe Mach Force XP Catback exhaust system, guaranteed to out perform any system on the market today. Normal stock exhaust systems are far too restrictive, and do not allow the engine to perform to its full ability or efficiency. With its pinched bends and narrow, thin tubing, it is no surprise why so many people opted to get something with a little more bite. 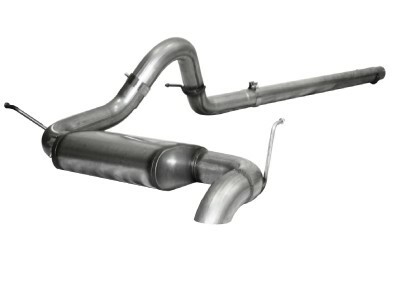 The Mach Force Catback Exhaust System is designed with 409 stainless steel and mandrel bent tubing to create the best exhaust flow possible, and it shows with an increase of +13hp in horsepower and +15 torque on the dyno. AFE has developed this system from the ground up with a muffler designed to create the perfect amount of back pressure and flow capabilities to allow your Jeep to breathe easier then it ever has before. This combination gives your Jeep a one of a kind sound that will set your Jeep apart from the crowd. AFE has designed this exhaust system with monstrous 3" exhaust tubing and mandrel bends to make sure that your Jeep has enough room to stretch its legs, and will give you significantly more exhaust volume then stock. aFe's Engineers designed this exhaust system with off roading in mind, ensuring sufficient clearance for additional suspension travel and aftermarket exhaust systems allowing for improved approach/departure angles. This system has a unique right side exit that provides a unique and aggressive look to your Wrangler. The aFe Mach Force XP Catback was not only designed to give your Jeep maximum power. Because the stock exhaust system is so restrictive the engine actually has to work harder to push out the excess gases. This creates more strain on the engine and in turn will burn more fuel then needed. By installing a more free flowing system such as the Mach Force XP, it will lower the back pressure and make the exhaust a lot more free flowing. This takes the strain off the engine and will give your Jeep that much needed fuel mileage. This is a win, win situation and within a couple years it will pay for itself. It comes with a lifetime warranty so there will be no doubts that this system will be the only one you will ever have to buy. The aFe Mach Force XP Exhaust System comes to you with a lifetime warranty and guarantees that it will not rust or corrode because of its stainless steel construction. to factory mounting points so installation requires no modifications be made to your Jeep.